I praised my Razer Hammerhead BT headset last week for its superb sound output from my Mac. I’d like to say it was easy—but I had to do some digging to make it so. Before anything, in order for great, lag-free sound to come out of your Mac via Bluetooth, your Mac must support Bluetooth 4.0 or greater, and your BT headset must also support it. To find out if your Mac supports this BT version, select About This Mac from the Apple menu, then click on the System Report… button near the bottom of the window that results. Alternatively, you could check the Bluetooth version by using Mactracker, a free utility available on the Mac App Store, which holds the specifications of every Apple device ever built. Ever. Your BT headset’s box or its website should clearly state which version of BT it supports. If it doesn’t support 4.0 or better, none of the rest of the info in this article will work. If your Mac supports BT 4.0 and you have a MacOS released since 2015, you’re good on the Mac side. Your Mac supports both the aptX and the AAC codecs, so if your headset has either, you’re in business. If your BT headset not only supports BT 4.0+ but also supports the aptX codec, you’re in great shape! Most headset manufacturers brag about aptX if they’ve got it, so check the manufacturer’s website to find out. Failing aptX, check whether the headset supports Apple’s AAC codec (it almost certainly does if advertised as usable with iOS.) AAC won’t get you quite as good sound as aptX, but many people can’t hear the difference. So now, you know that your BT headset and your Mac can talk to each other fast enough and well enough to get beautiful sound. What’s the problem? Sometimes, the Mac refuses to use higher bandwidth codecs, even though they’re available on both the Mac and the BT headset. Why, no one seems to know, least of all Apple. But you can work around this with a developer utility called Bluetooth Explorer, which you can get via a link in this article by John H. Darko. Mr Darko’s article also explains how to force use of aptX or AAC by using Bluetooth Explorer once you’ve got it. I did this, but my MacBook Air was still downgrading to the horrid SCO codec. Now what? 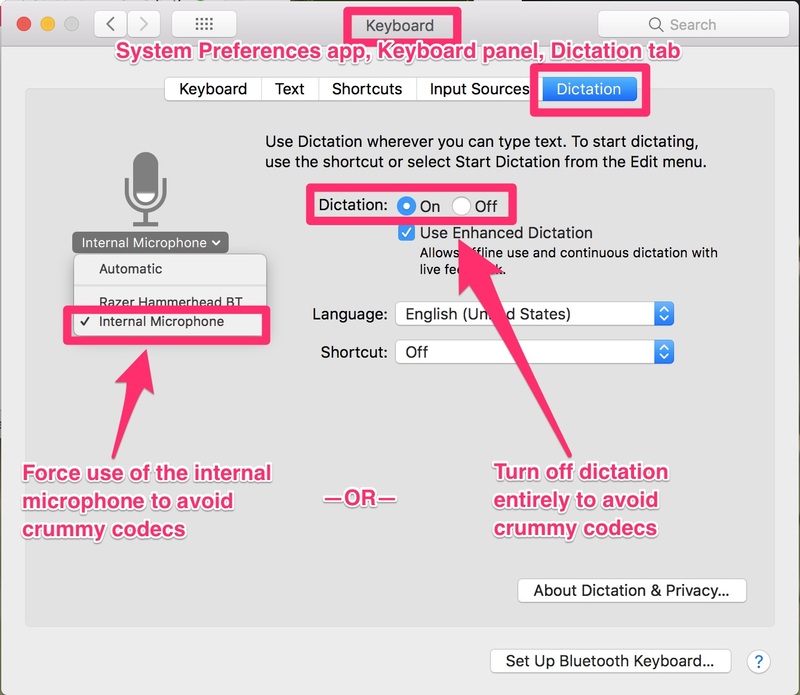 One solution is to simply turn off dictation on your Mac. If you’re a writer, though, this may not be practical. An alternative solution is to leave the internal microphone selected for dictation, and manually switch to your BT headset mic if needed. Here’s how to implement either possibility. OR—from the drop-down menu beneath the microphone icon, choose “Internal microphone.” (Do not choose Automatic; that’s what’s causing the problem.) The machine may whine2 about how this won’t give you best results. Ignore it. Now music should pour forth from your Mac and sound beautiful on your BT headset. 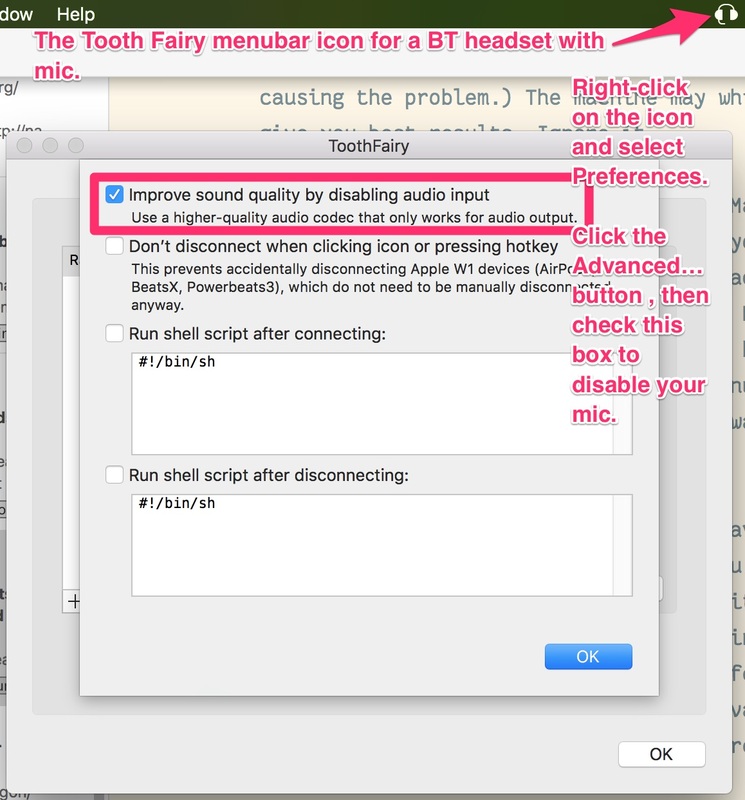 If you should decide that you want to dictate some text and use your BT headset to do it, go back to System Preferences and manually change dictation input to your BT headset. The codec will downgrade but you won’t care because you’ll be dictating and you can’t listen to music at the same time anyway. Manually change dictation input back to Internal Microphone when you want to listen to music again. Tooth Fairy makes controlling your mic more convenient. Another possibility: a little utility available on the Mac App Store, called Tooth Fairy, $2.99 USD. It will let you put an icon in your menubar for your headset (and also display its battery status). You can connect and disconnect the headset by clicking on the icon. If you right-click, you can access Tooth Fairy preferences—which let you disable the headset mic, by means of its Advanced… settings. Thus you avoid needing to dig deep into the System Preferences; leave them as they are, and just turn the mic on or off as needed from the Tooth Fairy icon. Hi, I am having the same Issues, thanks for the post, but unfortunately my Receiver (A2DP/AVRCP + AAC), won’t change to AAC codec, no matter what I tried, even Apple Bluetooth Explorer and Enabling via Terminal did not resolve the issues. Any other things you did to achieve good output? Sorry, but other than assuring that my Mac was NOT using my headset for sound (microphone) input, no. If you do find some other way to help things along, please do post here!